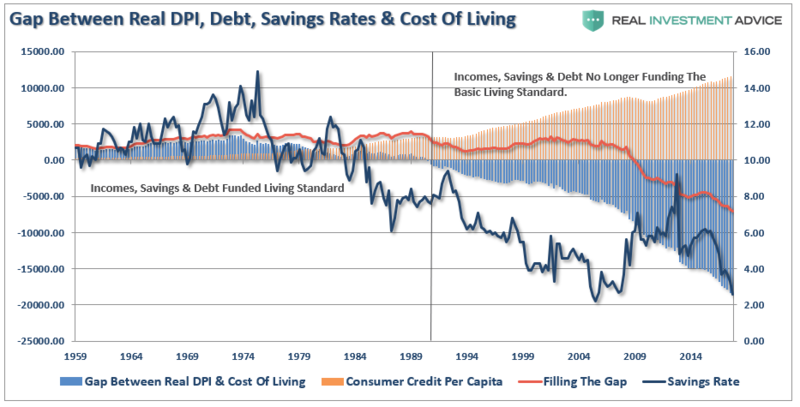 Americans have become inured to so-called financial “crises”. How can one not be jaded when the federal government repeatedly hits some supposed “debt ceiling,” which then magically goes away, time and time again. Or when things get so bad the government has to shut down altogether. Of course, when government shuts down in this fashion, nothing changes during that time for the average American. Then the government reopens, and nothing changes. It will be interesting to see, when The Big One comes down the pike, how long it will take for people to figure out that this time, it’s not a drill. The $4 Trillion pension problem is rapidly exposed which will require significant government bailouts. When prices decline enough, the record levels of margin debt are triggered which creates a liquidation cascade. As prices fall, investors and consumers both contract further pushing the economy further into recession. Aging baby-boomers, which are vastly under-saved will become primarily dependent on social welfare which erodes long-term economic growth rates. With the Fed tightening monetary policy, and an errant Administration fighting a battle it can’t win, the timing of the next recession has likely been advanced by several months. The real crisis comes when there is a “run on pensions.” With a large number of pensioners already eligible for their pension, the next decline in the markets will likely spur the “fear” that benefits will be lost entirely. The combined run on the system, which is grossly underfunded, at a time when asset prices are dropping will cause a debacle of mass proportions. It will require a massive government bailout to resolve it. As debts and deficits swell in coming years, the negative impact to economic growth will continue. At some point, there will be a realization of the real crisis.